The Crowd Get User Data Vector Shader for 3Delight is a 3Delight shader which is able to read a vector user data of a given name stored in the currently rendered mesh, and return its value. This data can be used to feed other shaders in Maya that have a vector or color input. 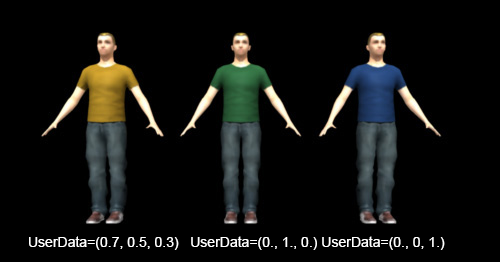 Refer to the Shader Attributes page to know how to store vector user data in a mesh. To create a Crowd Get User Data Vector for 3Delight, the 3Delight plugin (3delight_for_mayaXXXX) must be loaded.